Medical assistant schools and programs are available in several different educational venues in Maryland, including community colleges, accredited colleges, vocational schools, technical colleges and universities, many of which offer online courses. There are currently over 10,000 medical assistant jobs throughout the state with an expected growth of 30 percent over the coming decade. Although medical assistant salaries vary slightly depending on the area, the hourly median wage in Maryland is $5 more than the national wage. If you're looking for a rewarding career in healthcare in a state with growing opportunities, look into training and certification as a medical assistant in Maryland. Aspiring medical assistants start ton their career paths by first earning a degree or certificate in the field. This puts them on the path to helping patients and assisting health care professionals by managing medical offices and clinics, maintaining patient records, taking medical histories and scheduling patient appointments. To find the medical assisting program that allows you the time and resources you need to maintain your personal and professional obligations, do your research. 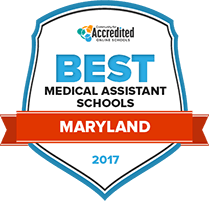 Our list of 2017's Top Medical Assisting Schools in Maryland can help. Students who are interested in gaining employment directly after graduation may be interested in pursuing Harford Community College’s associate degree or certificate in medical assisting. With the skills in administrative functions and medical understanding that are fostered in this program, students will be given a competitive edge over other future applicants to medical assisting positions. Students will work in small class environments meant to facilitate communal academic engagement and productive interactions between students and faculty members. Students may spend their free time socializing with their peers at one of Harford’s regularly held campus events. Frederick Community College offers an associate of applied science degree program in medical assisting that will guide students to immediate employment after their two years of learning. FCC is eager to accept students from a variety of backgrounds, and is willing to honor any applicable credits earned at a previous two-year or four-year institution of higher education. For students with busy daily schedules, FCC’s online or evening class sessions may allow for academic advancement while maintaining personal priorities. FCC students who excel in their academics may be eligible for certain merit-based scholarships that can help to lighten any financial stress applied by college tuition. A degree earned in medical assisting from Allegany College of Maryland will help guide students into a successful career as a medical assistant in a medical office, clinic, or urgent care facility. Students will take on both medical and administrative duties throughout their degree program, learning to schedule medical appointments, process medical payment, and assisting physicians during routine medical checkups. Allegany offers its learning in several different formats to fit the different needs of its students, including distance learning, evening courses, and even weekend courses. Allegany happily accepts applicable credits earned at different college-level schools to go towards an Allegany degree. Maryland medical assistant schools offer diploma, certificate and associate degrees. Finding a medical assistant school or program in Maryland is the first step to embarking on a healthcare career with stability and flexibility. Our search tool can help you find a school in Maryland that fits your needs, interests and budget. How is "medical assistant" defined in Maryland? Medical assistants are healthcare professionals who work under the supervision of physicians, usually in outpatient facilities, such as clinics and medical offices. They are trained to perform clinical duties including assisting during exams, preparing and administering medications and collecting and preparing lab specimens, as well as administrative duties. Licensure and certification is not required of medical assistants in Maryland. All that is needed is a high school diploma or GED. How do Maryland medical assistants maintain their credentials? Recertification by Examination To pass the examination originally taken to become a medical assistant. Recertification by Continuing Education To accumulate 60 recertification points over the five years of the current CMA credential’s validity. This must include 10 administrative points, 10 general points, 10 clinical points, 30 points from a combination of the above categories. Are there tasks outside the scope of medical assistants in Maryland? The following 2014 salary figures from the Bureau of Labor Statistics (BLS) offer a comparison between medical assistant earnings in Maryland and nationally. Salaries for medical assistants can vary by thousands of dollars a year depending on location, illustrated by the 2014 wage amounts from the BLS shown in the map below. The highest paying areas are located in or around Bethesda, while Cumberland and Hagerstown have lower wages. Medical assistant jobs are projected to grow by 6.4 percent from 2012-2022 in Maryland. While this is respectable growth compared to other jobs, it's much lower than growth for medical assistants in other parts of the country. The table below compares Maryland medical assisting job growth with national growth. There is a wide range of medical assisting programs to choose from throughout the state of Maryland's universities, community colleges and vocational school, here are a few reputable ones to give you a place to begin your search. Accredited by the Commission on Accreditation of Allied Health Education Programs upon the recommendation of the Medical Assisting Education Review Board (MAERB). This is the website for the MSMA; a professional body which provides membership and promotes the professional identity of people in the medical assisting profession throughout Maryland. While the state does not require a license or certification, you may need one to get a position or a promotion. This site details the CMA and RMA and explain how you can take them. The AAMA provided certification, information and membership for medical assistants throughout the USA.